Knockhill Racing Circuit is in Fife, Scotland and opened in September 1974, now being Scotland’s national motorsport centre. The circuit was created by joining service roads to a nearby disused mineral railway and has two layouts, the 1.3 miles International layout and the 1 mile National layout. 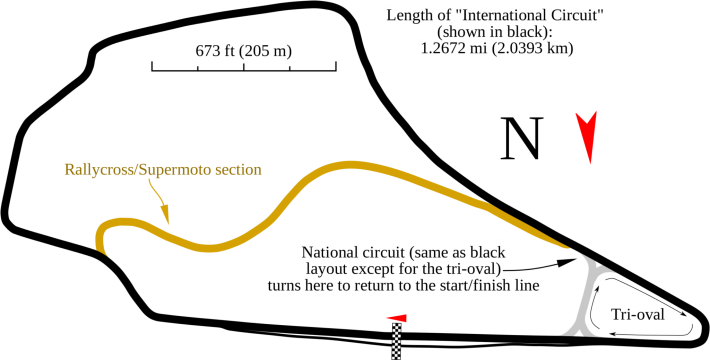 The former is most traditionally used and since the 1980s, Knockhill has been developed to a point where it is able to host rounds of most of the major British championships including the British Superbike Championship. Tight and twisty, a lap of Knockhill takes less than fifty seconds. Coming onto the start and finish, I’m quickly through the gears and up to fifth, trying to keep the front wheel down as much as possible over the bumps and brow of the hill in order to get as much power down as possible. I’m back down to third for the entry to Duffus Dip, which is a really important corner as you can pass someone on the way in and also set someone up for the next couple of corners. I trail the rear brake on the way in and then roll the throttle through Leslie’s, trying to get as smoother power delivery as possible for the entry into the right-hander of Scotsman. I’m down to second for this corner and you need to have the bike and electronics set up well for the exit in order to reduce the wheelspin as much as possible. I get the power down hard and then click third as I clip the rumble strip and then roll a little for the entry to the Arnold Clark Chicane. I’m through the chicane in third and the straighter you can make it, the faster you’ll get through it so you’re almost cutting the corner now. The bike’s really revving hard through here so I get up to fourth and then fifth as quick as I can along the short straight before setting myself up for Clark’s. You need to be really aggressive from the chicane up to there, also making sure you get the bike upright quickly to save tyre wear. I’m back down to fourth for the uphill and off camber corner and it’s important not to run wide as it’ll mess your speed up for the entire Brabham Straight through Hislop’s. I trail the brake on the way into Clark’s so that I can get set up properly for the left kink on the way out. I hold the bike right for as long as possible before flicking it left and if you can get it right you can hold the bike tight all the way down to Taylor’s Hairpin. It’s fifth gear along the straight before coming back to second, maybe even first, for the Hairpin. It’s really bumpy on the way in and it’s important not to be too hard on the brakes so that you can maximise the engine and stop the rear wheel from bouncing in the air. If you turn in too early for the hairpin you’ll lose all your exit speed and ruin the start and finish straight so you almost tip into the hairpin on instinct, taking a mid-apex. You ride the corner a little bit and then get the bike upright as soon as you can, banging it through the gears all the way up to fifth. The better the drive you can get on the exit of the hairpin, the quicker you can get through the gearbox and thus get the power down. 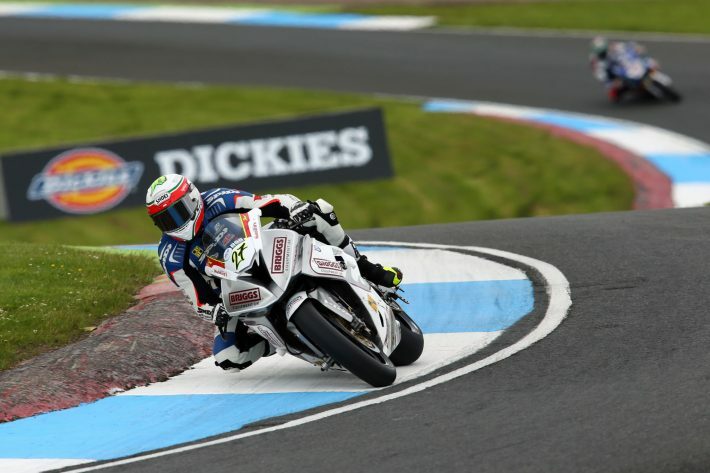 For me, the quickest way around Knockhill is to be as smooth as you can, have the bike set up so it turns quick and minimise the number of gear changes you make. If you can get the gearing set up to use as fewer gears as possible, you’re going to save time and lap quicker. 2016 British Superbike Championship, BSB R04, Knockhill, Fife. 25th June 2016.